The North Face Ultra Trail Du Mont Blanc, one of the hardest races in the world, takes place this weekend. We caught up with three time winner Lizzy Hawker. The North Face athlete, Lizzy Hawker, has been the first woman to cross the finish line three times, and she’s set to go for gold again. 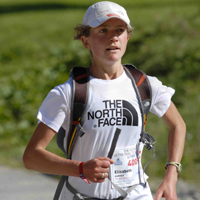 Taking place in Chamonix, France the event attracts the world’s best endurance athletes. Here, she gives a first hand account on how she is feeling, what she is expecting and her gruelling routine to ensure she is at her fittest. How are you feeling in the run up to the race? With a big race you have excitement, anticipation, trepidation, doubts, hopes – that incredible and wonderful mixture of emotions. Where are you training at the moment? Where’s your favourite place to train in the world? The mountains – they are my inspiration. How has your training schedule changed now its August (if at all)? The first weeks of August were a mixture of racing, training and work. The week before the race itself is important to find some quiet – to allow myself the time and space to prepare physically and mentally. Do you have a strict diet? How will this change in the lead up to the race and just beforehand? I have been vegetarian since the age of five so I always eat a natural diet with wide range of fresh fruit and vegetables, and avoid processed foods as much as possible. My motivation to run UTMB is to again be part of something that is so much more than just the incredible challenge of the race itself. Every runner, every volunteer and every supporter becomes part of something truly special. The motivation does not come only from the victory or the competition. In the end it isn’t just about the race. What’s your ultimate training tip? Run with your heart and soul as well as your head and legs. What’s the piece of kit you wouldn’t be without for the UTMB? The North Face Better Than Naked Jacket. It’s totally lightweight and perfect for endurance running. For more info head to www.thenorthface.com/eu and www.lizzyhawker.com.